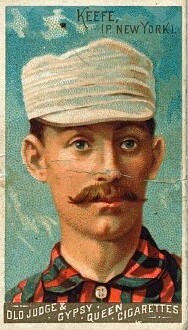 One of the greatest pitchers in 19th-century major-league baseball, Tim Keefe won 342 games and still ranks among the top ten pitchers in lifetime victories. He was known for his change-of-pace pitch, which he used to establish a still-standing major-league record of 19 consecutive victories in 1888. “No more graceful, skillful and strategic pitcher ever tossed a ball over the plate to the bewilderment and dismay of opposing batsmen,” one writer wrote of Keefe in 1890.1 In addition to his pitching prowess, Keefe was also a leader in the Brotherhood of Professional Base Ball Players, which led a revolt of National League ballplayers to form the ill-fated Players League in 1890. Where Keefe received his early education is unclear. By age 13 he and his older brother were listed as students in the 1870 federal census, presumably attending the Somerville public schools. Keefe likely attended Somerville High School in the footsteps of his older brother.5 Whether or not Keefe graduated from high school is unknown. After his schooling, Keefe, like his father, worked as a carpenter.6 According to Keefe family legend, Tim’s father encouraged his son to learn mathematics and science, to be more of an engineer than just a simple carpenter, and disliked his forays into baseball.7 But Keefe kept at baseball, playing for local amateur teams and steadily working his way up the ranks. In 1877 he devoted more time to baseball than to carpentry when he played for the Our Boys team, based in Boston, which played a schedule during the week, not just on Saturdays, that ranged from college and independent professional teams to the Boston team in the National League. An incident in the fall of 1877 helped to shape Keefe’s attitude about professional baseball in relation to making a living as a carpenter, while also establishing his strong feelings about labor-management relations. Keefe had worked 11 days between October 26 and November 8 to build a house on a lot of land on Springfield Street in Somerville, for which he had a verbal agreement to be paid $22 for labor and materials. When the property owner, who lived in Cambridge, took advantage of the Somerville carpenter and refused to pay him, Keefe sued him and filed a mechanic’s lien on the property.8 Keefe decided that if it took these lengths to collect wages as a carpenter, he would be just as well off as a professional baseball player. It was also one of the last times that Keefe acknowledged himself as “Timothy J. Keefe of Somerville,” as indicated in the land-lien recording. He moved out of his family’s house in Somerville, became an iterant ballplayer, and aspired to be a landowner in the more respected town of Cambridge. Keefe played for four teams during the 1879 season. He began with Clinton, but when the team relocated to Natick in June 1879, Keefe left the team. He wasn’t out of work long. Keefe caught on with the Utica, New York, team in the National Association, an East Coast league with teams that spanned geographically from Massachusetts to Washington, D.C. In mid-June Utica was on a road trip through Massachusetts and was seeking a new pitcher to reverse its losing ways. After Keefe pitched Utica to victory in an exhibition game in Boston against Harvard University, Keefe became the team’s new pitcher.11 When the Utica team disbanded in mid-July, Keefe joined the New Bedford, Massachusetts, team in the same circuit, which was managed by Jim Mutrie. After debuting in the pitcher’s box on July 22 with a victory over Brockton, Keefe became New Bedford’s regular pitcher. However, by mid-September, New Bedford was one of just four remaining teams in the National Association, in which the Albany, New York, team had edged the Washington Nationals for first place. Keefe left the New Bedford team to join the Albany team and pitched two games at the tail-end of its 1879 season. Because Keefe had experienced unlimited mobility in his first three years of full-time professional baseball, he expected to parlay his brief time with Troy into a better deal with another major-league team. However, the National League ballclub owners had agreed to implement the reserve clause for the 1880 season. It allowed each club to protect five players each season from jumping to another team. Keefe was one of the five players on Troy’s reserve list for the 1881 season.13 Because he was reserved, Keefe was compelled to accept Troy’s salary offer of $1,500 for the 1881 season and couldn’t negotiate to play for other teams.14 When Troy reserved Keefe again for the 1882 season, he tried to hold out for more money, but had to settle for the same $1,500 salary. “I was considered a robber because I held out for $2,100,” Keefe recalled later in life about being one of the earliest holdouts in baseball history.15 With his 1877 mechanic’s-lien experience fresh in his mind, Keefe embarked on a decade-long quest for increased fairness to players in baseball contracts, which culminated in his involvement with the Brotherhood of Professional Base Ball Players in 1885 and the formation of the Players League in 1890. For the 1881 and 1882 seasons, Keefe and Welch split Troy’s pitching duties, which then still required an underhand delivery; Buck Ewing and Bill Holbert alternated at catcher. Keefe had more opportunities to pitch in 1881, since a rule change that year moved the pitcher 50 feet from home plate, from 45 feet, which encouraged managers to use a two-man pitching staff. Keefe had an undistinguished pitching record with the mediocre Troy team, 18-27 in 1881 and 17-26 in 1882, over an 84-game schedule. With Day outbidding other owners for the services of Ewing, Keefe was able to negotiate a hefty salary increase for himself by deftly playing Day against both the Troy management and other bidders. As the New York Herald reported in mid-October, “The [Troy] players have been coquetting, however, to a considerable extent, holding off from signing with the various managers, and thereby increasing the bidding by saying that they intended remaining in Troy, while at the same time they declined signing with that club.”17 Keefe no doubt relished his final interaction with the Troy club at an October 10 meeting at which management agreed to his salary demand, but he then refused to sign a contract to that effect and left the meeting.18 Three days later the Troy Daily Times reported that several Troy players had signed with the New York City team.19 Keefe signed with Day for a $2,800 salary, nearly double his Troy salary, which was good for both the 1883 and 1884 seasons. Mutrie paired Keefe with Jack Lynch as the Metropolitans’ two-man pitching rotation in 1883, for the lengthened 98-game schedule, and in 1884, when the schedule was expanded again, to 112 games. Keefe, who had been a mediocre pitcher with Troy, blossomed with the Metropolitans. He racked up impressive pitching records of 41-27 and 37-17 during his two years with the Metropolitans, including a league-leading 359 strikeouts in 1883. In 1884 Keefe led the Metropolitans to the American Association pennant, before they faced the National League champion Providence Grays in a best-of-three-games World Series. Keefe lost both of the first two games, then umpired the third, inconsequential game. With his $2,800 salary with the Metropolitans, Keefe earned far more than he’d ever make as a carpenter. He began to wear tailored suits, to emulate a well-heeled Cambridge citizen, which distanced himself from the blue-collar background of his father, a carpenter, and his brother, a plumber. He taught himself subjects to compensate for his lack of a college education, studying accounting to understand business and shorthand to take good notes of meetings. In New York he was exposed to the theater and other social activities of wealthy people that he could never experience in ethnically stratified Boston, which provided few such opportunities for those of Irish ancestry. Keefe’s performance with the Metropolitans led Day to hatch a plan to reunite Keefe with his former Troy teammate Mickey Welch as the pitchers for the 1885 season on his National League team, to be managed by Mutrie. Day orchestrated a ruse to transfer Keefe and teammate Dude Esterbrook from Day’s American Association team to his National League team by having Mutrie take them both on a boat trip to Bermuda. On the ship Mutrie gave both players their ten-day release from their contracts with the Metropolitans, and then 11 days later signed them to National League contracts.22 Day and Mutrie had to hide the two players from the other major-league teams because at the time the ten-day release worked like today’s waiver wire, so any team could acquire the player’s contract during that ten-day period before the player was freed from the reserve clause and could negotiate with other teams. Keefe made his New York City debut in the National League on April 24, 1885, with the team now known informally as the Giants, which had six future Hall of Fame players (Keefe, Welch, Buck Ewing, Roger Connor, John Ward, and Jim O’Rourke). Behind Keefe’s 32-13 pitching mark, the New York Giants made a run at the National League pennant, but finished in second place behind the champion Chicago team, led by John Clarkson, a Cambridge native. Transferring to the New York Giants changed Keefe’s life in many ways, most notably situating him as a teammate of John Ward, who had recently graduated with a law degree from Columbia College. Ward led the players’ revolt against the National League owners, which began with the establishment of the Brotherhood of Professional Base Ball Players in October 1885; at the group’s first meeting in November 1886, Ward was named president and Keefe was selected to be secretary-treasurer.24 Ward often characterized the negotiation plight of the professional baseball player as no better than that of livestock or slaves. Given Keefe’s early experiences in Troy with baseball negotiations, he completely agreed with that assessment. Although he was now well paid, Keefe still fought for the rights of the average ballplayer. Keefe had his finest National League season in 1886, when he led the league with 42 wins, 62 complete games, and 535 innings pitched, as the league expanded its schedule to 126 games. The key to his pitching success was his brain, not his brawn. Throughout the 1880s, Keefe successfully adapted to continual rule changes that modified how and from where pitchers could throw the ball, lowered the number of balls a batter needed for a walk, and elongated season schedules. After he purchased this land in Cambridge, newspaper accounts almost always referred to Keefe or his family as being from Cambridge, not from his real home in Somerville at 54 Springfield Street. For example, in the summer of 1887, the New York Times reported that “Keefe, of the New-Yorks, has gone to Cambridge, Mass., where his father died yesterday.”33 Patrick Keefe actually died in Somerville and had lived in Somerville for nearly 20 years.34 Keefe, who was born in Somerville and had resided there since he was a boy, likely perpetuated the myth that his home was in Cambridge, since this highbrow address was far more prestigious than working-class Somerville. This myth helped to support his persona as the gentlemanly “Sir Timothy,” the nickname he acquired around 1888 based on his unflappable demeanor and desire for fairness. The “from Cambridge” line also made for good association with another great 19th-century pitcher, John Clarkson, who truly hailed from Cambridge. In 1887 a rule change required Keefe to abandon the “hop, skip, and jump” delivery by pitching from a fixed position, with the “pitcher compelled to keep both feet on the ground and face the batter before delivering the ball,” and keep his right foot on the back line of the pitcher’s box and allowed to take only one step forward.35 Other rule changes were instituted that year to reduce the advantage of the pitcher, such as needing four strikes for a strikeout (up from three) and five balls for a walk (down from six), and allowing a hit batsman to take first base. Batters also were credited with a base hit for a walk that year. While the new rules stifled the success of many pitchers that year, Keefe adapted by focusing more on his scientific approach to deceiving the batter. Keefe was in no hurry to rejoin the Giants for the 1888 season, as he held out for a higher salary in his contract negotiations with Giants owner John Day. That spring Keefe made his first appearance as a college baseball coach, at Amherst College.40 In the late 19th century, professional baseball players were college baseball coaches only in the sense that they trained players before the season. The student who was captain of the college team was effectively the coach, since he negotiated the team’s schedule and made the playing decisions. The Giants won the 1888 National League pennant and played the St. Louis Browns of the American Association in a postseason World Series that fall. Keefe won four games (the first, third, fifth, and eighth games) to propel New York to victory in the best-of-ten-games match. After winning the series, Ward participated in Chicago owner Albert Spalding’s world tour that winter along with a number of other ballplayers. However, after Ward’s ship had left San Francisco for Hawaii, the National League owners announced a fixed salary-classification structure (maximum $2,500) that they proposed to implement without input from the Brotherhood, which would depress salaries and eliminate contract negotiations. Keefe, who was still in New York City opening up his sporting goods store, was thrust into being the Brotherhood spokesperson while Ward was overseas. By 1889 the library in Cambridge was already under construction across the street from Keefe’s property on Cambridge Street, on land donated by Frederick Rindge; what could possibly inflate the $5,614 purchase price of Keefe’s land were two new high-school buildings that were to be built partially on other Rindge land, but which needed further land acquisitions.52 Cambridge English High School and the Manual Training School were both built in 1892 but, unfortunately for Keefe, the town planners decided not to expand north of Cambridge Street to acquire land for the new public high schools. Two weeks into the 1889 season, Keefe and Day were still at loggerheads in their salary negotiation. On May 9 newspapers reported that Keefe said he’d accept $4,500, but not Day’s offer of $4,000.55 That day, with all four Giants pitchers either injured or sick, Buck Ewing pitched in the game against Boston. New York won, but clearly Keefe’s services were needed. Day caved in and offered Keefe the proposed $4,500 compromise.56 Keefe accepted and pitched his first game on May 10. Despite the many distractions during the 1889 season, the Giants won a second straight National League pennant and met Brooklyn of the American Association in the World Series that fall. Mutrie had overused Keefe down the stretch in order to edge Boston in the neck-and-neck battle for the pennant, with Keefe nailing a victory on the last day of the season to clinch the title. However, a tired Keefe was ineffective in the opening game of the 1889 World Series, and only pitched briefly in relief in one other appearance, as Ed Crane started five (and won four) of the eight meaningful games in the Series to lead the Giants to victory over Brooklyn. While Keefe was intellectually committed to the Players League movement, he wasn’t entirely committed financially. In mid-December 1889, Keefe transferred ownership of his real-estate property in Cambridge to his mother.61 This move ensured that creditors couldn’t reach this asset for legal judgments against him (or his firm Keefe & Becannon, which was a partnership, not a corporation) if the Players League failed. Six days after Keefe transferred his real-estate property to his mother, the New York Giants served papers on Ward as they pursued a legal injunction to stop Ward (and by implication Keefe and the other confederates) from jumping to the Players League and thus enforce the reserve-clause aspect of his National League contract. Among a lot of nasty name-calling and legal action, the Players League fought for spectators with its National League counterparts. Keefe had an uninspiring season with the Players League Giants. He secured his 300th career victory on June 4, although to no fanfare at the time. His season ended prematurely when he broke the index finger on his pitching hand on August 19. He tried to pitch on September 8, but lasted only one inning. Almost all teams in both leagues lost money. The competition in New York City financially crippled Day of the Giants, as he lost tens of thousands of dollars and was nearly bankrupt. While the Giants of the Players League came close to breaking even, Talcott and the financial backers took advantage of Day’s precarious financial situation and quickly negotiated a deal after the season ended. They agree to merge the two teams with the resulting team to play in the National League and the Talcott faction, not Day, in charge. With the flagship New York team abandoning the Players League, the league itself soon imploded and ceased to exist by January 1891. During the winter of 1891, Keefe re-signed with his old team, the New York Giants of the National League, for the 1891 season. Ever the negotiator, Keefe held out for his $4,500 salary paid in 1890, but settled for a reduction to $3,500 for the season.63 However, the Giants used Keefe sparingly during the first half of the 1891 season and he was released in July; he then signed with the Philadelphia team. In the winter of 1892, Keefe returned to college coaching and began a stretch of six straight winters coaching the Harvard baseball team to help its pitchers prepare for the coming season.64 Harvard was just a quarter-mile from his property in Cambridge, and about a mile from his parents’ home in Somerville where he stayed when not in New York City. Keefe pitched his last major-league game on August 15, 1893, and was released by Philadelphia the next day. The lengthening of the pitching distance to 60 feet 6 inches reduced the effectiveness of the 36-year-old pitcher. He obviously left on good terms, since he umpired Philadelphia’s game on August 17. Upon his retirement as a ballplayer, Keefe was the career leader in strikeouts with 2,564 (a record broken by Cy Young in 1908) and had the second-most career victories with 342, just behind Pud Galvin. Keefe found more respect as an umpire in the Eastern League, where the players were more intent on advancing to the National League than showing up an umpire. He served as a minor-league umpire from August 1896 to September 1897. Keefe became a recluse following his snubbing by Harvard. During the summer of 1899 one writer noted, “One rarely hears the name of Tim Keefe mentioned now. The former great pitcher seems to have dropped entirely out of sight and sound.”70 Indeed, over the next quarter-century until his death, Keefe stayed out of the public eye with only rare exceptions. Keefe chose family over baseball. In 1898 his brother Daniel, a member of the Massachusetts militia, was involved in the Spanish-American War; with a wife and three young children, Keefe’s brother could no longer look after their widowed mother. Keefe built two multifamily houses on the remaining piece of land he owned on Cambridge Street in Cambridge, one house at 1653 Cambridge Street and the other at 89 Trowbridge Street.71 His mother (who technically still owned the property) and his two older sisters, Kate and Mary, moved from Somerville to live in one of the apartments in the house at 1653 Cambridge Street.72 Keefe, who divided his time between New York City and Cambridge, earned an income from renting apartments in the multifamily buildings. After his mother died in 1909, Keefe moved into the house on Cambridge Street with his sisters, who both never married. By 1910 Keefe was also single, having divorced his wife, Clara.73 He and his wife did not have any children. In July 1912 New York Giants pitcher Rube Marquard tied Keefe’s record for 19 consecutive victories. However, as Marquard approached the 19-win threshold, there was no mention of Keefe’s name, since most baseball observers believed Marquard was chasing a record of 20 wins set by Pat Luby in 1890. After the fact, Luby’s streak was found to be only 17 wins, and only then was Keefe’s name thrust into the spotlight as the rightful record holder.77 If Keefe had an opinion about Marquard tying his record, he did not share it with any baseball writer for publication. In 1928, Boston Globe sportswriter Ford Sawyer ran across Keefe at a Red Sox game at Fenway Park, where “the 70-year-old real estate owner is unknown to the vast majority of the thousands who are urging on their Boston favorites.”78 Keefe, who now regularly attended ballgames once a week, told Sawyer that baseball was “fundamentally the same old game” as back in the 1880s, and that he particularly liked to watch Ty Cobb. Tim Keefe died on April 23, 1933, in Cambridge and is buried in Cambridge City Cemetery. In 1936, at the time of the first BBWAA election for the Baseball Hall of Fame, Keefe’s pitching exploits for the New York Giants in the 1880s were largely forgotten, as he received just one vote on the 78 ballots cast for the 19th-century stars component of the initial Hall of Fame class. A sign honoring Keefe today adorns Tim Keefe Square in Cambridge, at the corner of Cambridge and Trowbridge Streets, in front of the house at 1653 Cambridge Street where Keefe had lived for the last two decades of his life. Bryan Di Salvatore, A Clever Base-Ballist: The Life and Times of John Montgomery Ward (New York: Pantheon Books, 1999). Roy Kerr, Buck Ewing: A Baseball Biography (Jefferson, North Carolina: McFarland, 2012). William McNeil, The Evolution of Pitching in Major League Baseball (Jefferson, North Carolina: McFarland, 2006). Jim Moore and Natalie Vermilyea, Ernest Thayer's “Casey at the Bat”: Background and Characters of Baseball’s Most Famous Poem (Jefferson, North Carolina: McFarland, 1994). Lee Allen, “Cooperstown Corner,” The Sporting News, April 4, 1964. Harold Kaese, “Keefe Fanned Mighty Casey,” Boston Globe, February 9, 1964. T.J. Keefe, “Curves or Liners: The Vexed Question in Base Ball Circles, Boston Globe, October 21, 1888. Ford Sawyer, “He Pitched 19 Straight Wins,” Boston Globe, May 27, 1928. Philip Shirley, “A Chat with Keefe,” Sporting Life, February 24, 1906. “A Declining Baseball Star: Timothy J. Keefe, Once the First Pitcher Among Baseball Players,” New York Tribune, October 4, 1891. “Tim Keefe, Noted Pitcher, Is Dead,” Boston Globe, April 24, 1933. Ancestry.com, Cambridge Directory and Somerville Directory. Baseball-Reference.com, Tim Keefe playing record. Massachusetts State Archives, Boston, Massachusetts, birth, death, and marriage records prior to 1910. Middlesex South Registry of Deeds, Cambridge, Massachusetts, land records from 1870 to 1920. U.S. Census Bureau, federal census records for decennial years from 1860 to 1930. 1 Sporting Life, May 31, 1890. 2 The Cambridge Directory for 1857 lists the Keefe family as living on Columbia Street, near Hampshire Street. The 1860 federal census (Series M653, Roll 508, Page 324) lists the Keefe family as living in the working-class Cambridgeport section of Cambridge. 3 Birth records for 1857 in the Massachusetts State Archives (Volume 106, Page 204). 4 The 1870 federal census (Series M593, Roll 631, Page 396) lists the Keefe family as living in Somerville, but associates no street names with respondents. The Somerville Directory lists the family in 1873 as living at Columbia Street, near the marsh, and in 1877 at 68 Concord Avenue. The 1880 federal census (Series T9, Roll 546, Page 339) lists the Keefe family as living at 52 Springfield Street in Somerville, which is located about 50 yards from the Cambridge town line. 5 His brother Daniel “received his education in full at the Somerville grammar and high schools,” according to a 1901 biography. See Charles Winslow Hall, Regiments and Armories of Massachusetts: An Historical Narration of the Massachusetts Volunteer Militia, with Portraits and Biographies of Officers Past and Present (Boston: W.W. Potter, 1901), 52-53. 6 Somerville Directory, 1877. Keefe also reported his occupation as cabinetmaker in the 1880 federal census (Series T9, Roll 805, Page 344), even though he was a professional baseball player by that time. 7 Lee Allen, “Cooperstown Corner,” The Sporting News, April 4, 1964. 8 Land record dated November 30, 1877, at the Middlesex South Registry of Deeds (Book 1458, Page 103). 9 “The Clintons of ’78,” Boston Globe, March 24, 1889. 10 Karen Nugent, “Heirloom Diamond: Clinton Ball Field Crowned as World’s Oldest,” Worcester Telegram, October 4, 2007. 11 Boston Globe, June 14, 1879. 12 Troy Daily Times, August 19, 1880. 13 Minutes of the National League meeting held on October 5, 1880. 14 All pre-1890 salary figures are from the National League report reprinted in Sporting Life on April 5, 1890. 15 Ford Sawyer, “He Pitched 19 Straight Wins,” Boston Globe, May 27, 1928. 16 Roy Kerr, Buck Ewing: A Baseball Biography (Jefferson, North Carolina: McFarland, 2012), 34-35. 17 New York Herald, October 13, 1882. 18 Troy Daily Times, October 11, 1882. 19 Troy Daily Times, October 14, 1882. 20 John Kieran, “When They Were the People,” New York Times, January 25, 1938. 21 New York Clipper, November 11, 1882. 22 New York Times, March 27 and April 13, 1885. 23 Land record dated March 13, 1885, at the Middlesex South Registry of Deeds (Book 1696, Page 197). 24 Bryan Di Salvatore, A Clever Base-Ballist: The Life and Times of John Montgomery Ward (New York: Pantheon Books, 1999), 175, 189. 25 Boston Globe, October 14, 1885. 26 “A Declining Baseball Star: Timothy J. Keefe, Once the First Pitcher Among Baseball Players,” New York Tribune, October 4, 1891. 28 Philip Shirley, “A Chat with Keefe,” Sporting Life, February 24, 1906. 29 T.J. Keefe, “Curves or Liners: The Vexed Question in Base Ball Circles, Boston Globe, October 21, 1888. 31 Land record dated July 26, 1886, at the Middlesex South Registry of Deeds (Book 1759, Page 132). 32 G.M. Hopkins map of Cambridge, 1886. 33 New York Times, July 9, 1887. 34 Death records for 1887 in the Massachusetts State Archives (Volume 383, Page 213); Somerville Directory, 1873 to 1887. 36 New York Times, August 21, 1887. 37 Jim Moore and Natalie Vermilyea, Ernest Thayer's “Casey at the Bat”: Background and Characters of Baseball’s Most Famous Poem (Jefferson, North Carolina: McFarland, 1994), 209. 38 Moore and Vermilyea, Ernest Thayer's “Casey at the Bat,” 221. 39 Sporting Life, February 9, 1888. 40 Boston Globe, March 12, 1888. 41 Sporting Life, April 18, 1888; New York Times, April 20, 1888. 42 New York Herald, April 20, 1888. 43 Boston Globe, April 24, 1888. 44 Sporting Life, April 25, 1888. 45 New York Times, April 27, 1888. 46 Boston Globe, April 24, 1988. 47 “Ladies Who Love the Game,” New York World, May 6, 1888. 48 New York Times, August 15, 1888. 49 New York Times, July 29, 1888. 50 The Nadjy uniforms were highlighted in a Keefe & Becannon advertisement in Sporting Life, March 20, 1889. 51 “Twirler Tim Is Rich,” New York World, January 14, 1889. 52 “The Rindge Gifts,” in The Cambridge of 1896 edited by Arthur Gilman (Cambridge: Riverside Press, 1896). 53 New York Times, April 18, 1889. 55 New York Times, May 9, 1889. 56 New York Times, May 10, 1889. 57 Marriage records for 1889 in the Massachusetts State Archives (Volume 399, Page 480). The marriage was not publicly revealed until four days later when it was reported by newspapers on August 23. 58 New York Times, December 10, 1889. 59 Sporting Life, December 17, 1889. 60 Sporting Life, June 28, 1890. 61 Land record dated December 17, 1889, at the Middlesex South Registry of Deeds (Book 1947, Page 522). 62 New York Herald, July 19, 1891. 63 Sporting Life, March 21, 1891. 64 Harvard Crimson, January 16, 1892. 65 Land record dated March 19, 1894, at the Middlesex South Registry of Deeds (Book 2259, Page 228). 67 Joe Vila, “Without Mercy is the Average Partisan Base Ball Fan,” Sporting Life, April 13, 1912. 68 New Haven Register, July 9, 1896. 69 Sporting Life, November 13, 1897. 70 Sporting Life, July 8, 1899. 71 G.W. Bromley & Co.’s Atlas of Cambridge shows the property as undeveloped in 1894, but with two houses on it in 1900. 72 The 1900 federal census (Series T623, Roll 656, Page 129) lists Keefe’s mother and sisters, along with three boarders who were law students at Harvard, but not Keefe himself. Keefe could not be located within the 1900 census. 73 Keefe reported his marital status as divorced in the 1910 federal census (Series T624, Roll 596, Page 142), He reaffirmed this status in both the 1920 census (Series T625, Roll 707, Page 230) and the 1930 census (Series T626, Roll 916, Page 8). 74 Martin Gardner, The Annotated Casey at the Bat: A Collection of Ballads About the Mighty Casey (New York: Clarkson Potter, 1967), 24; Boston Globe, September 25, 1917. 77 Sporting Life, July 13, 1912. 79 Washington Post, May 20, 1938. 80 Harold Kaese, “Keefe Fanned Mighty Casey,” Boston Globe, February 9, 1964.